Stretching from Revelstoke to Castlegar is the Arrow Lakes Reservoir, a 230 kilometer-long man-made body of water that was formed by flooding and combining two separate, shorter lakes into one body of water in the 1960s. To power the Hugh Keenleyside Dam in Castlegar, the reservoir’s water levels annually rise and fall by as much as 20 metres, roughly the same height as a five or six-story building. TRU graduate student Amy Duncan wants to know if these fluctuating water levels pose a threat to the Western Painted Turtle population that resides within the reservoir. The focus of Duncan’s thesis research, which began in January 2013, is to identify patterns between the fluctuating water levels and the overwintering, or hibernating, patterns of the turtle. In British Columbia, a blue-listed species is a wildlife species that the Ministry of Environment has determined to be at-risk, but not yet endangered or threatened like a red-listed species. 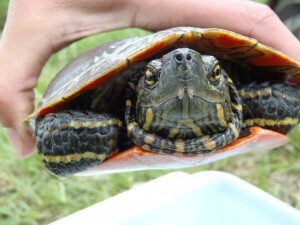 For the painted turtle to overwinter, they require a habitat that will not freeze or become deprived of oxygen. 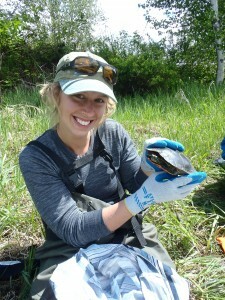 Part of Duncan’s research looks at the effect that water levels have on the turtles’ overwintering habitat. Another aspect of the research involves tracking how the behaviours of the turtles are affected. To conduct these studies, Duncan is studying three sampled populations of turtles, all of which were located just south of Revelstoke, B.C. The first two populations are located directly in the reservoir, while the third population is located in a nearby pond unaffected by the reservoir’s fluctuations in water levels. This third sample serves as a control group, which helps isolate the reservoir’s fluctuating waters as the independent variable when Duncan compares results between the populations. The first step in her research was identifying the precise locations that the turtles were using to hibernate. Wireless transmitters attached to the turtles help researchers like Duncan locate and track the turtles from above the water. With the transmitters in place, Duncan was able to track the turtles even as the surface of the waters froze over. Duncan’s endeavor is ambitious, but she has supporters at her side to help accelerate the progress of her work. Two years into her project, Duncan says the study has been informative, but also admits it is more complex than she anticipated. With her Master of Science in Environmental Science program coming to an end, she hopes to wrap up her research within the next few months. “The end of April would be my two-year mark for my master’s program, so I hope to be done by then, or be defending my thesis around that time,” she said. Duncan’s research has already received some public exposure. She has presented her work at various conferences and forums throughout B.C., including the Columbia Mountains Institute of Applied Ecology’s Annual Researchers’ Forum in Revelstoke. She hopes her research will continue to gain traction within the scientific community in the near future. Duncan also hopes that the lessons learned through her research will eventually help other researchers get a head start on similar studies in other regions.